President Illam Aliyev of Azerbaijan addresses the Global Forum on Youth Policy. Deliberations on a modern youth policy framework continued today in Azerbaijan’s capital, Baku as hundreds of experts, policymakers, researchers and activists met for the second day of a United Nations-backed meeting, which is expected to usher in a set of focused guidelines to assist counties in defining, planning, financing, implementing and evaluating youth policy. On the penultimate day of the First Global Forum on Youth Policy policy experts, youth activists and Government delegations gathered in Baku pressed ahead with efforts to revive commitment to ensuring the national and international policy frameworks take into account the needs of young people and provide for their participation in decision-making, as set out in the 1995 World Programme of Action on Youth. The United Nations Secretary-General’s Envoy on Youth Ahmad Alhendawi held talks in Baku with over 30 country representatives including from Ethiopia, Albania, Mali, Fiji, the Russian Federation, Brazil, Kuwait, Spain, Croatia, Turkey, South Africa, and others. Briefing the UN News Centre following his meetings, Mr. Alhendawi said that while each nation faced unique challenges and aspirations, they all agreed on the urgency to address increasing youth unemployment and improve access to quality healthcare and education. The Forum’s focus now is on reaching a consensus on what youth policy means and from that building a set of guiding principles for youth policy. Several side events also took place today with the goal of building partnerships among different stakeholders and bridging the gap between grassroots activists and those in Ministry halls. “How do I get those points I hear from vulnerable teenagers riding the bus into the oak-paneled walls of Parliaments and into vocational strategies, drug strategies, and security strategies,” asked Howard Williamson, now a youth policy expert at the Council of Europe, one of the co-conveners of the Forum. Mr. Williamson, who also teaches at the University of South Wales, recalled beginning his career in youth policy decades ago and put things into historic context by presenting to an audience archive documents of a United Nations youth policy from the 1960s. “Sadly, we are still pretty bad at involving the voices of young people into the debate,” he admitted. Youth life is inherently local but it is high-level debate that shapes issues. Countries may have a lot of committed ideas but often lack the practitioners to do the work. “There’s always a question of access routes because even when a policy is adopted it might reach some young people in cities but neglect young people in rural areas and the country,” he said. Youth policy financing is a critical issue as well, ranging significantly from country to country. The budgets of Norway compared to that of Latvia are very different. The same can be said comparing Asia to Africa. While mechanisms, resolutions and legislation may frame youth policy, they do “no good” without proper and adequate financing. Too often criminal justice systems spend too many resources criminalizing young people who do not need to be criminalized, said Mr. Williamson. 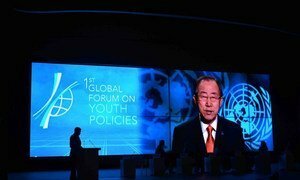 Governments should concentrate more on positive youth policy, than regulating and sanctioning the lives of young people. Being civically active helps young people avoid falling into bad habits for example drinking, smoking and doing drugs. Emphasizing the importance of sport, the President said Azerbaijan has opened its doors to host the European Games next year, which will bring 6,000 athletes to Baku. Young people around the world must “raise your voices” so they are heard loud and clear, United Nations Secretary-General Ban Ki-moon told a packed audience of youth Ministers, experts, activists and volunteers this morning, kicking off the First Global Forum on Youth Policies, in Azerbaijan, itself a nation with more than half of its population under age 29.